The 24th of June 2012 is yet another tragic day in the history of Bhutan. 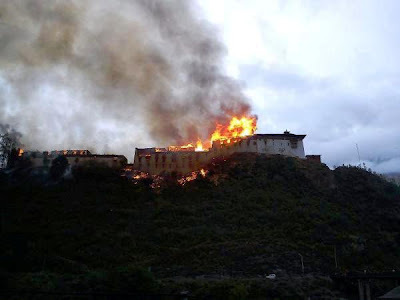 The 17th century gigantic fortress - the Wangdue Dzong, built by our founding father Zhabdrung Ngawang Namgyal was razed to the ground within couple of hours by the raging inferno. As i was about to logout from the facebook, a post appeared from the Hon'ble Opposition Leader informing about the fire disaster. At first, I could not believe it yet I could visualize the vulnerability of the structure of the Dzong. Moments later stream of comments followed with some people even liking the post. I wonder what they mean to convey when they hit the "like" button of the post. 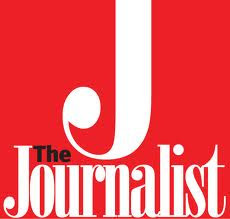 Does it mean they like the news or they like the information? Whatever it is, it's not a matter of concern at the moment. The fortress always stood magnificently overlooking the valley and stood as a test of time. Not only did it add on to the aesthetics of the valley, it was also a priceless possession of the country. Zhabdrung Ngawang Namgyel met a young boy named Wangdi playing in the sand and therefore named the dzong as Wangdi Phodrang (Wangdi's Palace). The dzong was built in 1638 by the Zhabdrung with the artisans as far as from Cooch Bihar. It was Bhutan's second capital until Trongsa was founded in 1644. The dzong was a dramatic example of Bhutanese architecture. The structure followed the contours of a ridge at the confluence of Punatsangchu and Dangchu. The Penlop of Wangdue Phodrang was the third most powerful ruler in the country. The cactus on the slope were planted to prevent invaders from climbing up to the dzong. The dzong was repaired after a fire in 1837 and an earthquake in 1897.
Who could believe that it would, on this day, be razed to rubble within few hours. Wangdue Dzong is gone with the wind. There are couple of questions i ask myself. It is said that by the time the fire was noticed, it was already late to contain it. Why was the country's priceless monument not equipped with smoke and fire detectors? Isn't the country in dire need of an emergency/firefighting chopper given the number of fire outbreaks and accidents? The nation has learned a lesson but at a huge cost. Shame on this generation. We totally failed to preserve what our forefathers did for more than three centuries.